AC Wood are completely dedicated to your total satisfaction. If you have any suggestions or comments please email us using the link on the store page. AC Wood take great care to ensure that all aspects of any sale and products are met with the highest standards. If you are unhappy with any aspect of our products and services please do not hesitate to contact us by email or in writing to the above address. This does not affect your statutory rights. Please note that these are photographic represenations and despite our best efforts shades may appear slightly different to the actual yarn. NB:- Please note that all knitting terms such as DK, Aran, 4ply. Lace etc are not absolute technical specifications and thus are not fixed criteria. 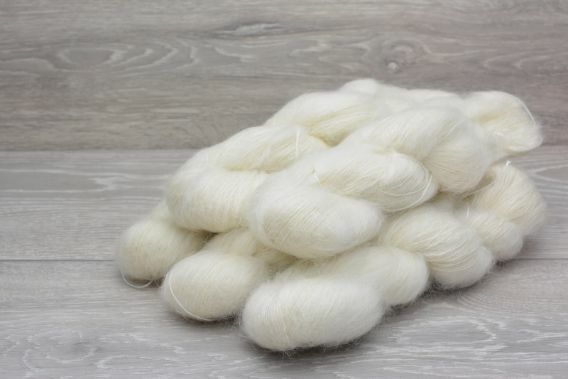 Also please note that whilst we produce these yarns to given terms using the established technical yarn counts for these, different fibres will give rise to different results in knitting terms. Delivery Schedule Your orders are despatched right away. We will normally send your order to you on the same or next working day. International orders are generally delivered within 5-7 days. If you are within the EU member states (non UK) and can provide a VAT number then we can set the system to invoice excluding Vat. 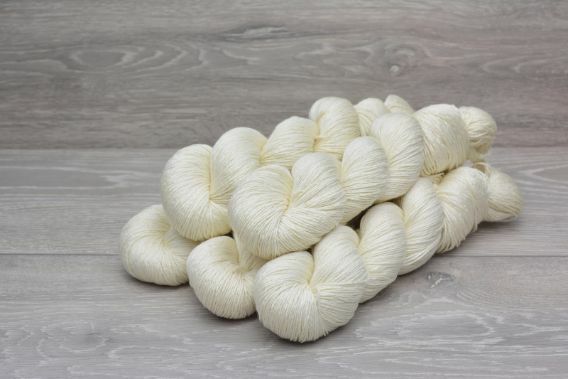 As our yarns are made mainly from natural materials and sold in their undyed state we would recommend that any garment directly knitted is hand washed or machine washed on a wool cycle at no more than 30 degrees and allowed to dry on a flat surface. 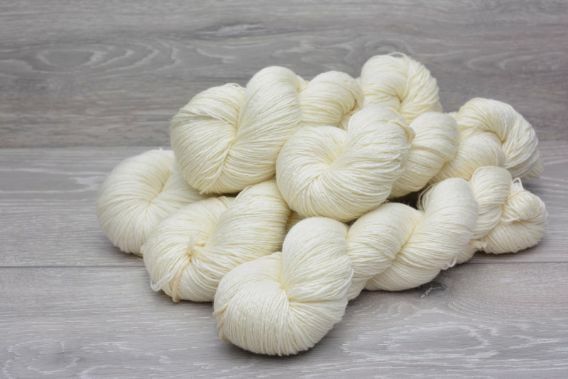 This includes yarns marked as superwash, whilst this process will improve the wash ability it is not a process that can eliminate milling or shrinkage usually brought on by washing in higher temperatures or by tumble drying. An alternative is to dry clean and we suggest that you speak to the dry cleaning professional about the composition of any garment before doing so. AC Wood (Speciality Fibres) Limited ("Yarnundyed") respects your privacy and is committed to protecting your personal information. The new General Data Protection Regulations operating in the UK allows you to have more control over how your personal information is used and how organisations like Yarnundyed collect, store and use your data. This privacy notice will tell you how we look after your personal information and about your privacy rights and how the law protects you. It applies to parties with whom Yarnundyed conducts business including customers, potential customers, suppliers and professional advisors. If you are involved in a transaction or potential transaction with Yarnundyed, we collect, use and store personal information relating to you. To the extent appropriate, this includes your name, business and personal contact details (email, telephone and delivery and invoicing addresses), log-in details for user accounts, correspondence and other transaction related information relating to your historical and potential transactions. Cookies are used on our Yarnundyed websites where they are strictly necessary for the site functionality. They are used to aid navigation, and to keep track of the contents of your shopping cart. If you log in to an account, your logged-in status is recorded in a temporary cookie. If you select the 'Remember Me' Option in the checkout, a cookie will be used to remember your details. You can turn off cookies by blocking them in your browser Privacy settings. If you turn off cookies, you will be unable to place orders or benefit from the other features that use them. 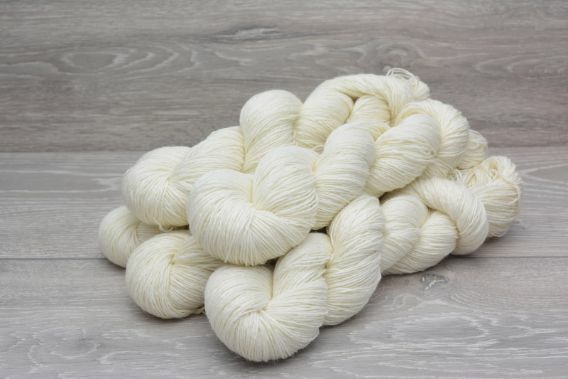 7. sending you periodic updates about Yarnundyed's business, activities and opportunities, in particular, by email. You can opt out of receiving updates at any time by asking your Yarnundyed contact to remove you from such updates. 3. where legitimately required, applicable regulators and other governmental agencies. As discussed above, our legal basis for collecting, using and storing personal information about you is that such processing is necessary for our legitimate interests in running our business, in advising on and processing actual and potential transactions or as required by law. We consider that the above purposes for which we use your personal information do not rely on consent as a legal basis for processing your personal data. If you do not provide certain information when requested, we may not be able to perform the contract we have entered into with you (such as supplying goods or services to fulfill a particular transaction), or we may be prevented from complying with our legal obligations (such as compliance with taxation or duty requirements). We only share your personal information with third parties as specified above and only to the extent as required in the provision of the services provided to Yarnundyed by third parties or as required by law. We require third parties to respect the security of your personal information and to treat it in accordance with the law. All our third-party service providers are required to take appropriate security measures to protect your personal information in line with the GDPR. We do not allow our third-party service providers to use your personal data for their own purposes. If we are required to transfer your personal data out of the European Economic Area, we will only transfer such data to countries that are deemed to provide a similar degree of protection. We will only retain your personal information for as long as necessary to fulfil the purposes we collected it for, including for the purposes of satisfying any legal, accounting, or reporting requirements. To determine the appropriate retention period for personal data, we consider the amount, nature, and sensitivity of the personal data, the potential risk of harm from unauthorised use or disclosure of your personal data, the purposes for which we process your personal data and whether we can achieve those purposes through other means, and the applicable legal requirements. In general, most of the personal data we hold is associated with transactions undertaken with Yarnundyed and is required under tax law to be held for a minimum period of six years but may be held for longer periods until destruction is arranged.
" Request access to your personal information (commonly known as a "data subject access request"). This enables you to receive a copy of the personal information we hold about you and to check that we are lawfully processing it.
" Request correction of the personal information that we hold about you. This enables you to have any incomplete or inaccurate information we hold about you corrected.
" Request erasure of your personal information. This enables you to ask us to delete or remove personal information in circumstances where there is no good reason for us continuing to process it. You also have the right to ask us to delete or remove your personal information where you have exercised your right to object to processing (see below).
" Object to processing of your personal information where we are relying on a legitimate interest (or those of a third party) and there is something about your particular situation which makes you want to object to processing on this ground. You also have the right to object where we are processing your personal information for direct marketing purposes.
" Request the restriction of processing of your personal information. This enables you to ask us to suspend the processing of personal information about you, for example if you want us to establish its accuracy or the reason for processing it.
" Request the transfer of your personal information to another party.